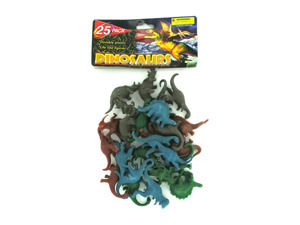 Perfect for pretend play, this 25-piece Toy Dinosaur Set features lifelike figures made of durable plastic in an assortment of fun colors including: red, blue, green and orange. Dinosaurs measure in the 2" range. Not recommended for children under 3. Comes packaged in a poly bag with a header card.